If you know me, you know how much I LOVE my birthday. I usually like to celebrate it for the entire month of May and this year I was very much looking forward to celebrating it in another country. 29 was spent in Modena, Italy with an entirely balsamic dinner (YUM!). 30 was an Epic Extravaganza with all my friends (and some special family members) in Colorado. 31 was destined to be international. When I planned this trip, I first had visions of mariachi bands playing in Mexico, then I thought maybe I’d celebrate with special sushi rolls and tea in Japan, then the thoughts of the Swiss Alps were in the picture, then the beaches of Croatia or Turkey. Finally I determined that a healthy pint of Guinness would be the ticket to welcome my 31st year. Pat and Alice (my hosts at the Valley House Hostel & Pub) were kind enough to start the celebration off right with a bottle of red vino and a chocolate cake! There were even candles to boot! Surrounded by my new friends (Jim, the Brit and Blanka, the Spaniard) I made a fabulous wish and blew them all out. It was a slow night at the hostel and pub so we call got to hang out in the bar with Pat & Alice, listen to some tunes and then retreat to our living room and watch a great movie- fun “slumber party” style! The next day I had to say good-bye to my first Irish “family” and board a train to go to my real family in Kilkenny. These good-byes are not getting any easier. I am meeting great people and connecting with them in ways that make it very difficult to say good-bye every few weeks. I guess that is a good problem to have. The Delaney’s met me with a warm welcome! I was shown to my own apartment at their home and was welcomed with this birthday spread! Not only did they have cards from my family in the US, but they mailed me cards in the Irish post so they’d look like they were sent from far away! So cute. Yes, you do see another bottle of red vino, chocolate and other treats. And my own fridge, there were Brie and Irish cheddar cheeses, jams, Irish soda bread, cookies, crackers and a few more adult beverages… all for me! Boy, they sure do know the way to my heart! Laura had also thoughtfully printed information on my next destinations, provided great magazines and books and stocked the apartment with lovely bath items and a lush robe. I felt like a queen! My actual birthday was a perfect day. Began with a run to a local estate and got caught in the rain- love the Irish weather (not). We then bought lotto tickets (no winners) and picked up Maia from school and went shopping at Mr. Wong’s. This is the best-kept secret in Kilkenny- a small shop with international ingredients from all over Europe and Asia- I was in food heaven! We bought stuff for our Italian feast and for making sushi and other delicious treats (yes, a hummus lesson did occur). 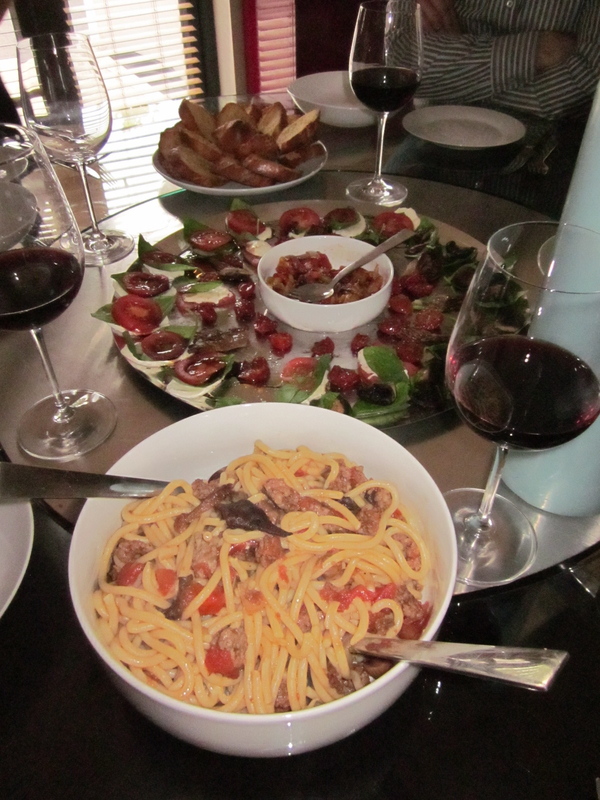 Went home and prepared my favorite Italian specialties… a variety of bruschetta and pici pasta, Siena-style. The cake was the best part- an individual linzer torte with 31 candles carefully placed in it. We skyped with my family in Florida and we all sang while I blew out the candles. Made the same wish again- can’t hurt right? The best part of all of this was that half the people skyping were celebrating their birthdays within one week of each other… Evan’s was on May 8th, Laura and her brother Larry share a birthday on May 13th and mine was May 11th. Fun! So 31 was brought in with family, food and vino… three of my favorite things. I think this will be a great year. Looking forward to what the next 365 days will bring. We all know that the past 365 have been quite an adventure and it’s not letting up any time soon. As they say in Ireland, “bang on”!